DeKalb County School District’s high school graduation rate has experienced notable growth over the years, according to recently released data from the Georgia Department of Education. Between 2013 and 2015, the District graduation rate improved 10.7 percentage points. During this time, the state graduation rate increased 6.2 points from 72.5 to 78.7 – DeKalb’s work toward closing the gap between local and state graduation rates continues to persist. 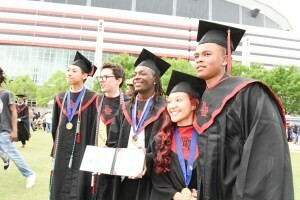 This year’s graduation rate for DeKalb is a 70.3. Nine high schools have rates above the state average – Arabia Mountain*, Chamblee Charter, DeKalb Early College Academy*, DeKalb School of the Arts, Druid Hills*, Dunwoody, Redan*, Southwest DeKalb*, and Tucker*. (* indicates Title I schools). Several of DeKalb’s demographic student populations had notable percentage point increases in graduation rate between 2015 and 2016 (details).